If you are experiencing technical issues with the app, please fill out our Contact Us form. You can find the iOS version by launching your "Settings" app, then tap "About". "Version" is roughly halfway down the list. The app version is on the Settings screen, which is accessible from the Quote Blast main menu. 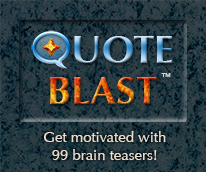 For other questions about the game, check the Quote Blast forum. Post your question to the forum if you don't find an answer.